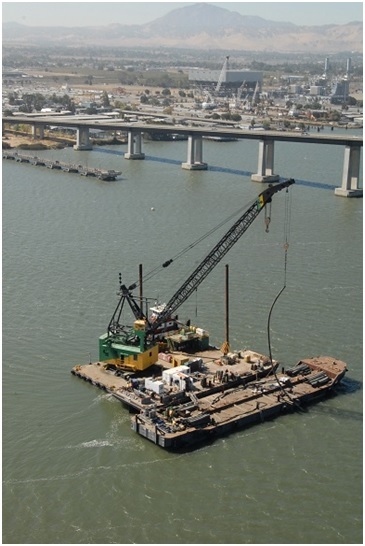 Submarine Pipeline Decommissioning - Global Diving & Salvage, Inc.
PG&E selected Global Diving & Salvage, Inc. as the prime contractor for the decommissioning and removal of three natural gas pipelines crossing the San Joaquin River. 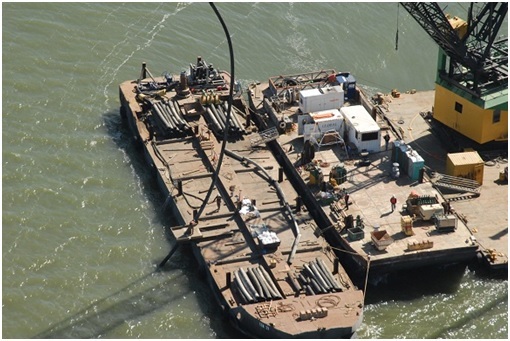 Global first removed the three 12-inch steel submarine pipelines, working from a derrick barge and completing the work within the permitted 3-month window. Divers used a guillotine saw to cut each pipe, which was lifted to the surface where asbestos coating was removed by HAZMAT crews on-site. Then the pipe was cut free into 100-foot sections and placed onto a materials barge for disposal. The following year, the team performed the demolition and removal of the reinforced concrete valve pit and anti-seepage wall at the North Landing site. Throughout the pipeline decommissioning project, Global managed multiple subcontractors providing permitting, environmental/HAZMAT services, survey teams and more.